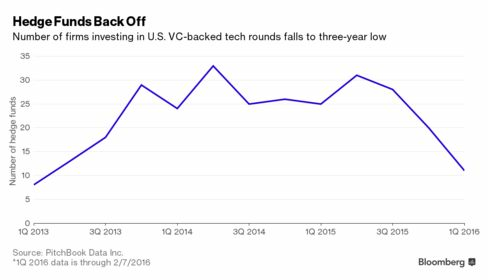 Hedge Funds Pumped Up Silicon Valley. Now They Are Pulling Out. In recent months, venture capital firms and mutual funds have become choosier about which technology startups they’re prepared to back. Now hedge funds, after helping push valuations to dot-com-era heights, are getting more picky, too. Last month, hedge funds participated in the fewest number of venture capital rounds in U.S. tech companies since 2013, inking just two deals, according to research firm PitchBook Data Inc. Even Tiger Global Management LLC, an early backer of Facebook and LinkedIn with $20 billion under management, has pulled back. Smaller firms are getting out altogether. Like VCs, hedge funds are more circumspect because some startups have failed to live up to their billing. Plus, in the wake of several disappointing tech IPOs, many of the most promising firms are choosing to stay private longer, meaning it takes longer to cash out. Investors’ stinginess is forcing startups to cut costs, fire workers and accept more stringent terms when raising money. Hedge Funds participated in 38 percent fewer global VC-backed deals from the third to fourth quarter of 2015, according to PitchBook. The total completed deal size dropped from $9.1 billion to $4.6 billion in the same period. The pullback is especially squeezing late-stage financing for tech companies, and pushing up the number of so-called down rounds — when startups accept a lower valuation in exchange for funds. The final stages (Series E and later) of financing based on lower valuations jumped to 26 percent in the fourth quarter last year, compared with 11 percent a quarter earlier, according to Fenwick and West LLP. In years past, hedge funds lacked the patience required to back tech startups, risky investments that often take years to pay off. But the latest generation of Valley firms have real businesses (unlike many of their dot-com counterparts) so hedge funds have been competing with VCs for some of the biggest deals. For example, Coatue Management LLC, a so-called crossover fund that invests in public and private companies, led a $55 million fundraising round for Snapchat. Valiant Capital Partners backed Pinterest, Dropbox and Evernote. Some small hedge funds were attracted by the outsize returns reaped by larger firms, such as the $3.2 billion paper profit Silver Lake Management LLC earned when Alibaba Group Holding Ltd. went public last year. But in recent months, some startups have put initial public offerings on hold after watching once high-flying firms stumble once they went public. Esty Inc. has lost almost half of its value since its IPO a year ago. Square Inc. and Match Group Inc. raised less than anticipated. Square’s pricing of $9 a share in the IPO fell short of the $15.46 a share it sold stock for in its last private funding round. Match is trading below the IPO share price. In 2013, tech investors could expect an average return of 160 percent from the last private fundraising round to IPO, according to data compiled by Irving Investors from BVMarket Data. In the second half of 2015, the average return fell to 29 percent. Dragoneer Investment Group backed four U.S. tech startups in 2014 (including Instacart and Airbnb) and just one last year (Dollar Shave Club), according to CB Insights; in 2014 Valiant backed two (Instacart and Uber) but invested in no U.S. tech companies last year.